PSA is a substance released from the prostate into the circulation. It can be measured by a simple blood test. The blood test has been in place for about 20 years or so. It was initially believed that the PSA level would be used to detect recurrence of prostate cancer following treatment as it should be zero following cure of the cancer. Later, its use was modified to help detect the presence of prostate cancer. The higher the reading of your PSA, the higher your risk of having a prostate cancer. It should be noted however that many factors must be taken into account apart from the absolute level of PSA to improve its utility in determining whether or not a cancer is present. There has been alot of debate regarding the use of PSA and its accuracy in detecting prostate cancer. There have in fact been many calls for us to stop using the PSA test to screen for prostate cancer. In some circumstances the result can be very confusing and there is considerable debate as to whether or not PSA gives us enough information. At present, PSA is really the only test we have to help us initially identify which men may be at risk. It is very important to discuss testing and the subsequent result of your PSA with your local doctor and with your Urologist to detrmine whether or not further investiagtion is warranted. Many other factors have to be taken into account including age and family history. It was initially thought that a PSA above 4 was indicative of cancer. It is now understood that PSA must be interpreted on an age related basis. This means that the normal PSA level for a young man is much lower than that for an older man. 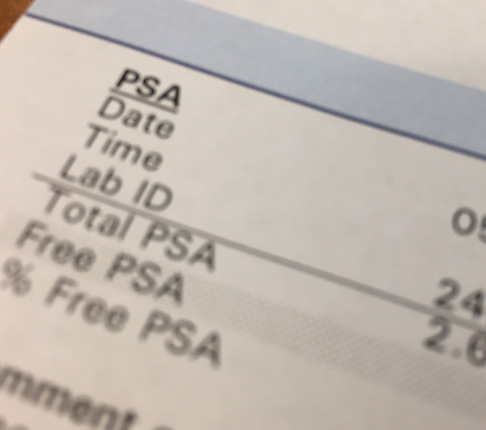 For a 50 year old man, the PSA should be about 2.5ng/ml while for a 70 year old man, a PSA of 4.5 to 5ng/ml is acceptable. It must be clearly understood however that there is no PSA value at which the risk of prostate cancer is zero. This means that in a very small number of men, cancer may be present at a very low level of PSA. The trend of PSA values over time (PSA velocity) is also very important. This is also true for PSA values that are below what is expected at a particular age. It is important to understand that the PSA value may be elevated for reasons other than the presence of cancer. Infection or inflammation in the prostate can cause elevation in the PSA. Larger prostates may be associated with higher PSA levels in the absence of prostate cancer. Sexual activity and can also cause a transient rise in the PSA level. If your Doctor is concerned about the level of your PSA he or she will discuss this with you. In almost all cases a biopsy of your prostate will be required to determine whether or not a cancer is present.